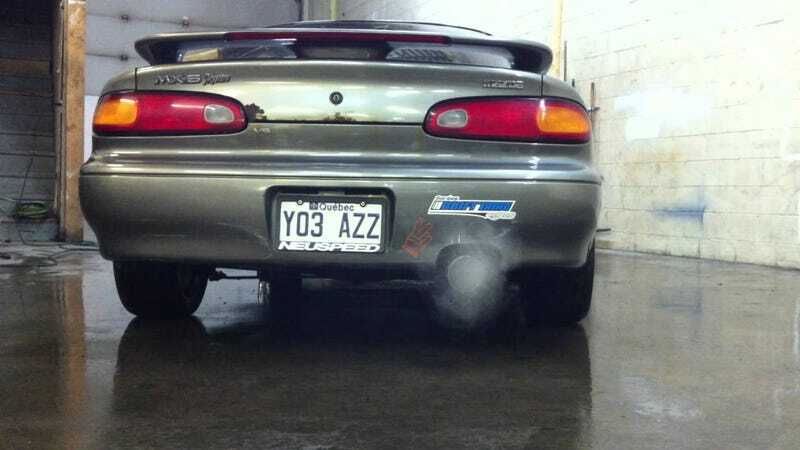 In Canada the ‘91-‘97 Mazda MX-6s were dubbed MX-6 Mystère and carried badges on the rear. The name was a leftover from a concept shown only once and in Canada. This convertible was originally planned as a factory-built model. Early viewing of finished product in California design courtyard at Mazda R&D (North America) “Mystere” (Denver) MX-6 convertible pictured with R&D president (left) former Creative Industries employee and Advanced Engineering Manager Gary Smythe, and V.P. of Design, Tom Matano. Missing from photo are Designer, Mark Jordan and author who served as Lead Engineer. Much engineering work was done in Detroit area where convertible would have been built.